Arby's offers a topped variation to their signature Curly Fries with new Loaded Curly Fries. 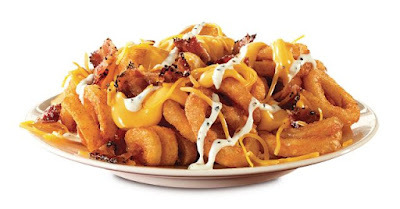 The new, limited-time menu item smothers an order of seasoned Curly Fries with warm cheddar cheese sauce, chopped pepper bacon, shredded cheddar cheese, and a drizzle of parmesan peppercorn ranch sauce. The suggested price for Arby's Loaded Curly Fries is $2.99. In select markets, it's also available as part of a 2 for $5 mix-and-match deal along with the Classic Roast Beef, Beef n' Cheddar, and Crispy Fish Filet sandwich. The fish sandwich makes its annual return for a limited time.